World of Architecture: Detailed info about the Sky City Project! Detailed info about the Sky City Project! 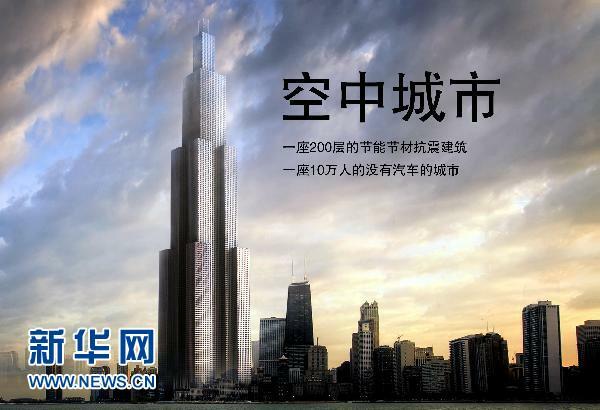 News about China building the world's tallest building in only 3 months has been traveling across the world with the speed of sound. We already covered this story (you can read about it here) and this time Broad Group published some very detailed info. Be first to read what is going on with the Sky City project! This is what we found on the Broad Group website just now! Sky City offers a multitude of benefits towards urbanization, sustainable research and the corporate aspirations of BROAD. Boasting a four to one ratio between fiscal savings and environmental protection; Sky City strives for energy, material, water and land conservation. Based upon practical building methods, our objective is to promote a high quality of life through lively urban design. Sky City will explore the roadmap of Chinese urbanization and improve the quality of citizen life whilst remaining in accordance with Chinese Government policies which govern the building and construction industry. We do not intend to erect a landmark, but to develop and extensively build, a practical building with medium cost and ultra-low energy consumption which will reciprocally shape the future urban life style. The building, with 220 floors (838 meters) and a construction area of 1 million square meters, is equipped with approvimatly 200,000 tons of steel and 104 elevators. Sky City will work in close collaboration with architects and engineers of the Burj Khalifa and utilize BSB modular technology, an construction method which features 95% factory prefabrication at a five story per day construction speed. 1) Magnitude 9 earthquake resistance whereas the local Changsha standard design is only Magnitude 6. Notes: 4 aspects lead to its remarkable earthquake resistance--trapezoidal pyramid solid structure, designed by famous architects, model testing and factory production with strict quality control. 2) Fireproof steel structure with fire resistance up to 3 hours. 3) 10 fire escapes, which are available to evacuate people at the whole floor within 15 minutes. 1) Energy saving: Unique technologies from Broad offer five times higher energy-saving than that of conventional buildings. Our BROAD unique technologies include a 15 cm thermal insulation, 4-paned windows, fresh air heat recovery, non-electric air conditioning, cooling-heating-power system and more. 2) Electricity saving: Electricity consumption is six times less than that of conventional buildings by using technology such as LED lighting and auto power- generated lifts. 3) Land saving: 5~10 times less land due to increased building height and decreased traffic. 4) Purer air: with BROAD unique fresh air machining this project offers 20 times purer air than outdoor air. BROAD technologies feature a 3-stage air purification, 7 times/h air exchange and 100% fresh air eliminating cross contamination. The project was initiated in April 2012 and is subject to the final approval by the government. On June 5, 2012 agreements were struck between BROAD and its partners, which was revealed across the Internet during which BROAD has been invited to release this blueprint. Official planning will be announced in August, 2012."